Social housing has received another boost after a consortium of housing developers and investors joined forces to create a £1bn fund to build homes on local authority-owned land, writes property developer Richard Carr. Last week, Richard Carr spoke about the European Investment Bank’s investment into social housing, which is also worth £1bn. This partnership has been brought together by Kier and Cheyne Capital, Lloyds Banking Group and the Government’s Homes and Communities Agency. They hope to provide around 10,000 homes across the UK within four to five years. The plan is purchase land from local councils who don’t have the resources to develop it. Using the councils’ local knowledge and recommendations the partnership will build an appropriate mix of houses to rent and buy. Social Housing in the United Kingdom has receive a major boost this week thanks to £1b worth of backing from the European Investment Bank (EIB), writes property developer Richard Carr. The EIB has teamed up with the Housing Finance Corporation (THFC) to provide £1b worth of investment which will help to alleviate shortages in affordable housing and accelerate construction of new build social housing. The scale and size of the investment highlights the country’s social housing problem; the £1b injection represents the largest ever support for social housing by the EIB anywhere in Europe. The 30 year long-term loan will be matched by THFC and guaranteed by the government meaning that £2b of overall investment will be available for new social housing and urban regeneration schemes by housing associations across the country. Richard Carr believes David Cameron’s recent promise to spend £140 million on regenerating housing estates in the UK will help increase the stock of affordable housing and make communities far more attractive to first time buyers. Cameron refereed to some of the UK’s most rundown housing estates as ‘Sink Estates’ when announcing the £140 million fund. He explained that the government will work with 100 housing estates to either bulldoze them and rebuild or to radically transform them. “Within these so-called sink estates, behind front doors, families build warm and welcoming homes. But step outside in the worst estates and you’re confronted by brutal high rise towers and dark alleyways that are a gift to criminals,” Cameron told propertywire.com. In response to Historic England’s revised guidance on the impact of tall buildings in the UK, property development specialist Richard Carr believes building taller is the only way the country will meet the current property demand. Historic England’s warning comes amid a surge in applications for new skyscrapers, specifically in London. Historic England, which acts as the Government’s statutory advisor on heritage issues, explained that they believes tall buildings could make a positive contribution to city life, but countered by saying they could also seriously harm places. Richard Carr believes that property developers should focus on building taller rather than across plots of land, thus saving space and an increased GDV. This in turn would reduce land values and as a result would increase payments for social housing as there would be higher excess profit. The UK government announced radical new rules to help free new land for homes in a bid to ease the county’s housing crisis, writes property consultant Richard Carr. Planning rules on brownfield sites across the UK have been relaxed by the government to encourage developers to build more homes for first time buyers. Chancellor George Osborne also confirmed that the housing budget will be used for low cost homes aimed at the younger generation and housing association tenants who will be given to the right to buy. The government will also bring forward sales of land, buildings and other assets which they own to raise around £5 billion, which will be used to fund new infrastructure projects. A report on the country’s long term infrastructure needs will also be commissioned, with the project to be headed by Lord Andrew Adonis. 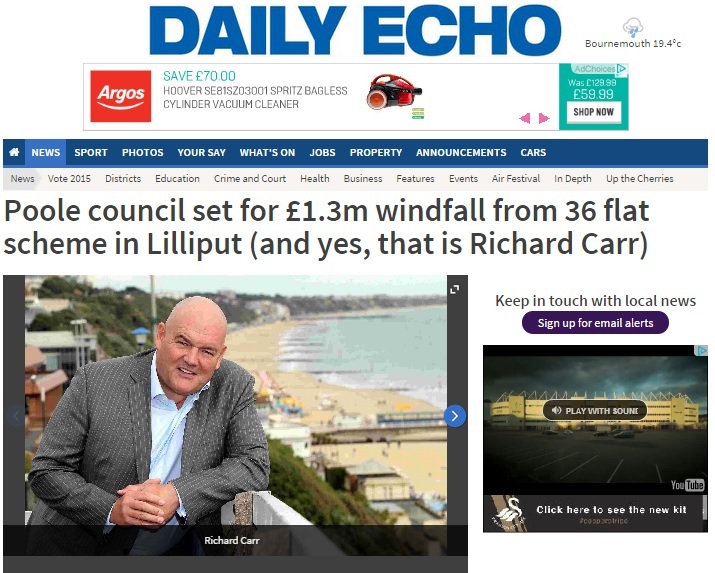 Poole-based Fortitudo Property and Development Specialist Richard Carr have this week featured in the Bournemouth Echo thanks their Lilliput Road development. Richard Carr has worked for the company for the past year, managing developments across the Poole area. In recent times he has spearheaded a project, which will see four properties in the exclusive area of Poole demolished and replaced with luxury flats. 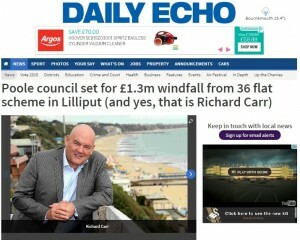 The areas local paper, Bournemouth Echo, picked up the story because of the record breaking developer contributions that the development will make to the “cash strapped council”. The four developments (74, 76, 78 and 80 Lilliput Road) will contribute totally £300,000 in social housing and a massive £1m in community infrastructure levy. The money will help the council improve areas of the community, whilst providing much needed funds for social housing. Richard Carr has been working as a Development Specialist for Poole-based Fortitudo Property for the past year and recently spearheaded four developments on Lillyput Road, Poole. Buildingtalk.com is recognised as one of the UK’s best resource websites for building professionals that delivers construction news, product and technical specifications, as well as case studies from suppliers across the industry. The website published Fortitudo’s and Richard’s developments, titled: ‘Private/Public partnerships help bridge the social housing gap’. Will the housing market benefit from online auctions? It has been reported this week that property auction house Allsop is planning the country’s first ever online-only auction for new build homes, writes Development Specialist Richard Carr. Will property auctions succeed online? The internet has transformed the way that the UK shops. Virtually anything that is consumable can be purchased online, but will an auction style method work for the property market? On Wednesday 10 June, newly built flats on the outskirts of London will go under the hammer for exactly 24 hours and 5 minutes. Legal experts have warned that major changes will need to be made if the incoming government is to fix the country’s housing shortage, reports Richard Carr. Rosemary Edwards, partner and head of residential development with corporate solicitors Shulmans LLP, told propertywire.com that planning permissions, regulatory requirements, funding, the economy and lack of skills have all added to the housing shortage. Is the UK’s housing crisis unsolvable? “I have heard of many major house builders being accused of land banking but this is patently ridiculous. A house builder’s business is entirely based on selling homes. If they can build them and sell them, why would they hold back?” she said. An increase in planning and regulatory hurdles have added time and costs onto projects for developers with requirements such as Community Infrastructure Levy and s106 agreements causing problems. Property experts have warned that a Labour led victory at this year’s General Election could have a detrimental effect on the housing market, an opinion shared by Commercial and Residential Development Consultant, Richard Carr. One of Ed Miliband’s many proposals is to introduce three-year tenancies, with only limited rent rises permitted in that period, in line with inflation. In response, two thirds of the UK landlords said they would leave the private rented sector, as the policy would limit the number of affordable rental properties. The research was conducted by the Residential Landlords’ Association (RLA) and their chairman, Alan Ward, warned that the proposals will leave tenants with less choice in a market of dodgy landlords.